The latest shiny bauble to come from iriver Japan is not the usual well-designed audio player, but a stylish car GPS system that happens to double up as a media player. 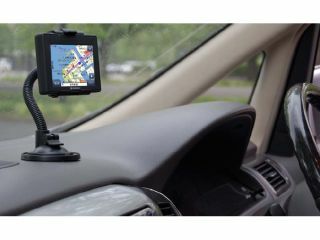 The ¥39,800 (£166) Siren PN100 comes with a 2GB SD card that holds maps of Japan along with a database of addresses and details of restaurants and other likely driving destinations. The screen is a 3.5-inch touch-sensitive number that is operated with the included stylus. Although a resolution of 320 x 240 pixels might make for a little too much squinting at the maps. Although the 178g PN100 has no memory of its own, there's still 512MB left over on the SD card once the navigation data is factored in. And, of course, other SD cards can be used when the satnav isn't needed. At those times, it can handle JPEG, MOV, AVI, MP3/4, 3GPP, ASF, WMA and WAV files, but not anything with DRM included. With a 1.5W speaker, a cigar-lighter connection for power and a sucker arm for connecting it to the car's dashboard, we can think of plenty of reasons that make the PN100 a fun starter navigation system. If you're in Japan.